We've never lived in Alaska. Visited once on a cruise ship. Spectacular place; I highly recommend it. But we've never lived there. The closest we've come to living in that kind of environment is Minnesota. While the landscape doesn't compare, the weather can be uncomfortably similar. Bitter sub-zero temperatures for weeks on end. Savage keening winds and snow; endless snow. We found intriguing ways to pass the time. There was a very small pond in our neighborhood. One January all the neighbors decided to have a "cookout" on the pond. Dads plowed so the kids could skate. Moms prepared salads and "hotdish" to share. We set up a few grills and had a party. Of course that day the air temperature was -10F, (-23C). The grills were used as much for warming fingers as for cooking. The high point came when I went to get some accouterments for my grilled sausage. The sauerkraut and the fork in it were a frozen mass. The mustard was more icicle than steady stream. Even the beer had turned slushy. In a large pot, bring the broth, ginger, star anise and cinnamon stick to a boil. Reduce heat and simmer for 15 minutes. Bring a large pot of water to a boil. When boiling, add the rice noodles and cook according to package directions. When finished, drain and set aside. While the broth is simmering, cut the sirloin into thin slices, making sure to cut across the grain of the meat. Set aside. After the broth has simmered, removed the star anise, ginger chunk and cinnamon stick. Return the broth to a low boil and add the fish sauce, NOTE: If you cannot find fish sauce, substitute clam juice, which should be available in your supermarket. Add the chopped bok choy and simmer for 1 minute. Add the beef, bean sprouts, salt and pepper. Boil for 30 seconds. Place noodles into serving bowls. Ladle soup over the noodles. Sprinkle scallions, cilantro, chilies and basil over the soup. Serve with a lime wedge garnish. Pretty simple actually. What's nice about this soup is the variety of spicy flavors. It's a nice change of pace from standard beef noodle soup. One thing, the Thai chilies can be quite hot, so if you're sensitive to that, drop down to a jalapeno or Anaheim pepper. OK crablings, The temperature is really going to drop this week, so I'm off to build a fire and wrap myself up in wool sweaters. Until next time, remember, you can do it, you can cook. I love wine. I love Pho. I hate wine with Pho. And not to be a nudge. I hate wine with all hot soups. Way to go Crabby - I was in a funk about what to cook up at the mountain this weekend and you came through! 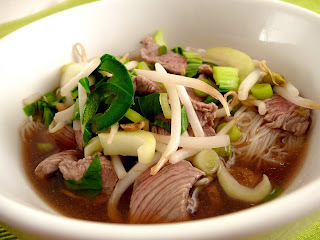 Made the pho this weekend and it was a huge success, even without the star anise. Super Yummy! Looks really yummy! 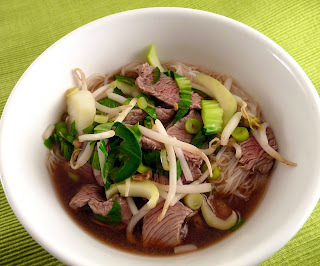 I've always wanted to try making pho. Pastitsio, "A Rose by Any Other Name..."